Cancer does not exist in isolation. Throughout the progression of the disease, all tumours interact with the healthy neighbouring tissues of the host and with its immune system, forming a heterogeneous balance. Cancer cells evolve and specialise in a similar way to that of an organism, adapting to their niche and producing a complex and inter-related structure. In order to understand a tumour, its cells must be studied in its native context: the host tissue. Unfortunately, many of the most powerful and high-throughput techniques available to science to gather informations about cells (the so called “Omics” approaches) operate on purified samples, and, as such, destroy the spatial organisation of the tissue and average signals from many cells, hiding potentially crucial details. Imaging-based techniques, on the other hand, can resolve individual cells very easily, and be used to study the spatial relationships between different parts of a tissue, but have generally a much lower throughput. Our laboratory is initiating a project that will attempt to close this gap, and apply high-throughput techniques to tissue samples in situ, preserving the spatial information. Moreover, we plan to use the tissue structure as a “reference space” to bind together, under a common coordinate system, many types of data coming from different molecular genotyping and phenotyping techniques. We will produce mouse models of cancer in which different tissue types (both from the tumour, the stroma and the immune system) are labelled with fluorescent proteins. We will then use a novel microscopy technique, serial two-photon tomography (Ragan et Al. ), to reconstruct whole-organ multicolour 3d images at single cell resolution by physically section an embedded tumour sample and imaging each slide as it’s being cut. We will then use these slices as a substrate for advanced molecular characterisation, using both medium-throughput (i.e. multiplexed immunohistochemistry and in situ hibridization) and high-throughput methodologies. For this reason, we are devoting a significant effort to the development of an in-situ sequencing protocol that will transform the endogenous DNA and RNA molecules of each cell into clusters that can be read using the popular Illumina “Sequencing-by-synthesis” chemistry, generating a complete genomic / transcriptomic dataset for each cell. For this project, we are going to merge chemistry, molecular biology and optical engineering, collaborating with the laboratory of Dr. Shankar Balasubramanian (one of the original inventors of Illumina sequencing) and with the CRUK Light Microscopy core facility. Spatial information is only part of the story: cancer change over time, and different parts of the tumour can mutate in different ways. Understanding the evolutionary relationships between the different cells forming primary tumours, recurring ones and metastasis is of utmost importance. In our project, we will tackle this challenge by creating a genomic “lineage register” which will mutate over the course of disease progression and keep track of cell parentage. Using high-throughput sequencing, we will read this register for each cell after the tumour is explanted from a model animal, and analyse it computationally to “trace back” the evolutionary history. For this endeavour, we will collaborate with the laboratory of Dr. Simon Tavaré , that has a strong expertise in bioinformatics and mathematical and statistical modeling. Our vision is to produce molecularly annotated “maps”, for an entire tumour sample in three dimensions, where for each cell different types of biological data can be accessed. These will include morphology, genomics, proteomics, and evolutionary lineage. The ability to bring together such a rich dataset for the same sample will be, we hope, a game-changer for many fields of biology. Our institute recently created a dedicated space for cutting-edge project, directed towards the development of new technologies or the porting of existing technologies to cancer research. Projects pursued within the “Innovation Lab” will involve more than one research groups and have a focus on multi-disciplinarity and innovation. Our project is one of the initial projects of the Innovation Lab, and will be pursued for a minimum of 3 years. Our initial aim is to develop and optimise the technologies required to realise our vision, and obtain proof of principle of them by mapping a small tumour sample. 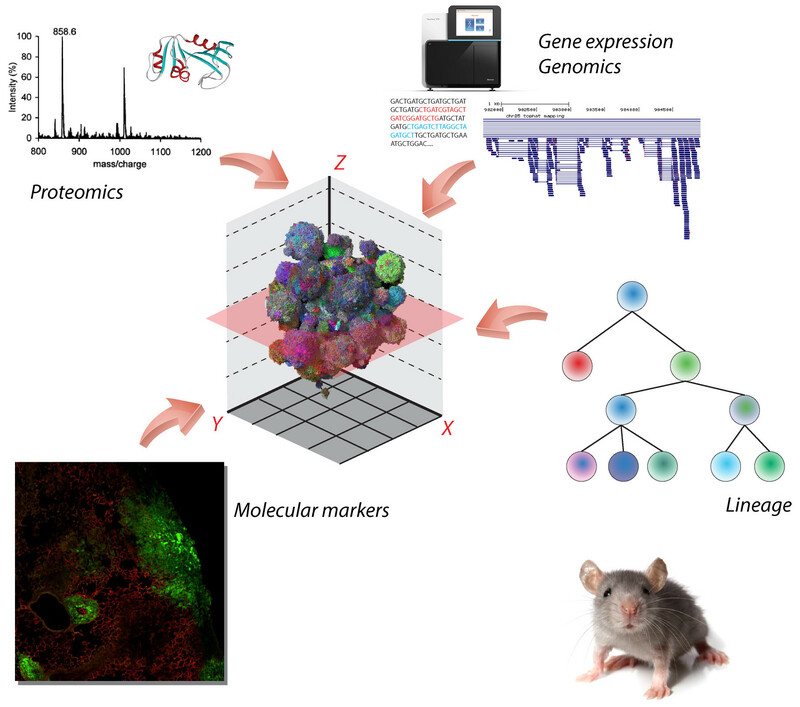 In parallel, we will seek to establish a pipeline to apply these techniques to a large number of tumour samples obtained from mouse models and patient-derived xenografts of several diseases.